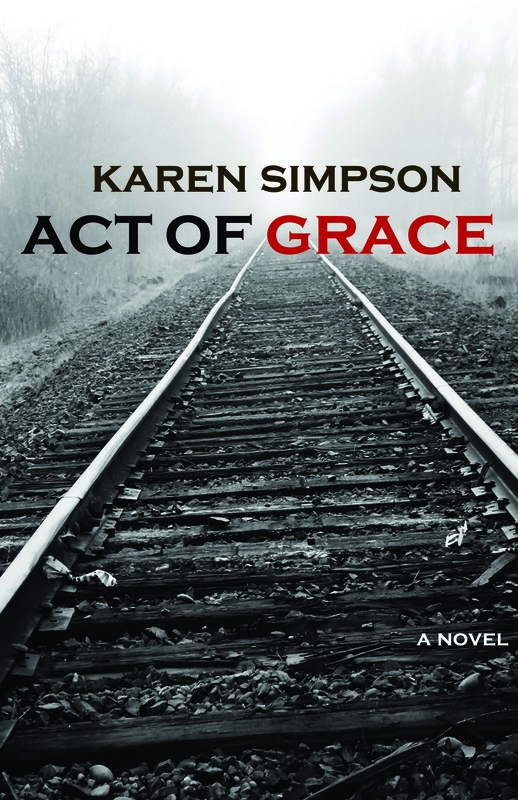 Karen Simpson’s debut novel, Act of Grace, tells the story of Grace, an African American girl who saves the life of Jonathan Gilmore, a Ku Klux Klansman, in a town with a history that divides its residents along racial lines. But as we begin to learn Grace’s reasons for committing, as she calls it, “racial treason,” we are taken on a remarkable coming-of-age-journey unlike anything you’ve read or seen on the screen. For the first week of our book club, we assigned the first ten chapters of Act of Grace. In these early chapters, Simpson masterfully sets the stage for a character who’s struggling with her weight and sense of self, and the ongoing pain of being rejected by her mother. Grace has a best friend (Shanta) who’s closer to her than her own, beautiful and oblivious sister (Jamila), and Grace is anxious to graduate and leave a town that’s full of whispers and haunting memories. An unusually swift current of hunger pulled me toward the kitchen. I made a big pot of grits, which I garnished with more than the recommended daily requirement of butter and cheese, and fried a half-pound of bacon––even though for the hundredth time that year I’d sworn I would become a vegetarian. My morning nerves seemed to drive my appetite. I ate and ate, my lips smacking out a greasy melody as I crunched on crisp cords of bacon and shoveled in snowy drifts of congealed corn. All the while I kept thinking about how good it would be to escape to college next year. Anyone who has lived in the desert realm of high school unpopularity knows how eager I was to go where no one knew me as me. It looked as if Spelman College might accept me, and I was excited. But as I sat there still hungry, even after two plates of food, my joy dissipated. I think even then I knew Spelman was being put on hold, but at that time, I had only a shadowy understanding of my true metaphysical identity. I fell into eating in a way that looked more greedy than spiritual. On this breathing side of eternity, devouring a whole pound cake is not considered an act of devotion, even if it is really good pound cake and you praise God for its existence in your life. What Mama thought about my appetite came out of Jamila’s more than willing mouth. “You need to stop eating because you’re disgusting,” she would sneer. It did occur to me that maybe she was right, but my hunger had its own rules. My soul needed fattening, and my spirit was skin and bones needy. As we join Grace on the first steps of her journey–and her journey is the key to understanding why she saves Jonathan’s life–Simpson introduces us to the characters who aid Grace on her journey and help her understand herself as she evolves. But we also experience events that confuse and embarrass Grace, and we understand her reluctance to accept her calling. Simpson’s early rooting of her main and supporting characters, and the town in which they live, are elements that hook readers to the writer’s story, and make them vested in the character’s growth. In these early chapters, we now have the foundation for the entire story, even though all has not been revealed. Share your thoughts about the first ten chapters of Act of Grace. What’s your sense of Grace at this point, and who she is? What do you think of her struggles, and are they typical of what we all go through as we enter young adulthood? Do you see elements of Vigilant in your city, and what are some of the things that continue to divide us? We’re live tweeting with Karen Simpson on Tuesday, May 14, 2013 at 7 p.m. You can ask questions about her book and writing process, and share your thoughts and favorite quotes or passages from the first 10 chapters of Act of Grace. Our Twitter handle is @plenarypub and Karen Simpson’s handle is @lafreya1. Use the hash tag #plenaryreads to join the discussion! Reading Assignment for the week of May 13, 2013: Chapters 11-20.